Spenser joined Hoffman Koenig Hering PLLC as an associate attorney in 2016. She practices in the areas of business litigation, insurance defense, family law, and employment law. Spenser grew up in High Point, North Carolina. She graduated from North Carolina State University with a Bachelor of Arts in Political Science. 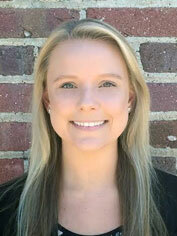 Spenser earned her Juris Doctorate from Elon University School of Law where she was the recipient of an Oaks Scholarship. At Elon, Spenser participated in Elon’s Small Business and Entrepreneurship Clinic where she advised clients regarding general business matters such as entity formation, document organization, and contractual concerns. She also worked as a research assistant for Associate Professor Enrique Armijo where she conducted research relating to media law and the First Amendment. She is a member of the North Carolina Bar Association and the Young Lawyers’ Section of the Greensboro Bar Association. Spenser has also helped tutor students preparing to sit for the North Carolina Bar Exam. In her free time, Spenser enjoys spending time with her husband and hiking with their dog.